If you're remodeling a home, chances are you want wood flooring in at least one of your rooms. Wood flooring has a timeless look, and it gives a house a warm feel. But there's almost too much information out there about wood flooring, making it hard to know what's what. Here are the basics of wood flooring. If you want wood floors, you have three main choices: 1.) solid hardwood, 2.) engineered wood, and 3.) laminate flooring. As the name implies, this type of wood flooring is solid wood all the way through, from top to bottom. It's similar to any other stick of lumber that sawn straight off of the log--no additional materials added. It's usually just called "hardwood floor." Hardwood flooring comes either unfinished or prefinished. Unfinished hardwood tends to be a little cheaper than prefinished but does require immediate light sanding, staining (optional), and sealing after installation. With prefinished, you can walk on it right after installation. With unfinished, you need to limit usage until it has been sealed. After sealing, you will need to wait at least 48 hours for the sealant to dry. Even then, additional coats may be required. With unfinished, the advantage is you can stain it and seal it to your exact specification. With prefinished, the advantage is the quick turnaround time. One popular hardwood is bamboo flooring (a grass rather than a hardwood, nonetheless it's usually classed as a hardwood). Bamboo flooring is highly valued for its apparent "green" and environmentally-friendly qualities. Hardwood must be nailed to a wooden sub-floor. Unlike the other wood flooring options, it cannot be installed straight on concrete or on top of your existing floor. Because of the nail-down requirement, it is recommended that you hire hardwood floor installers. If you wish, though, it is possible to rent floor staplers from home improvement centers. Because hardwood is especially prone to scratches and dents, you will want to pay special attention to the Janka hardness rating scale and buy a species (i.e., oak, ash, etc.) of wood appropriate to your lifestyle and your budget. Hardwood flooring's greatest advantage is that it can be re-sanded numerous times, extending its life literally for decades. Its greatest weakness: it cannot be installed in moist areas such as basements or bathrooms. Engineered wood flooring is an exciting alternative to solid hardwood flooring. Even though flooring companies would loudly protest at my description, engineered flooring basically is a sandwich of finish wood and plywood. The finish wood is what you see and walk on. The plywood underneath comprises 80-90% of the floor. But it's the plywood that distinguishes engineered wood flooring from solid hardwood. Each ply runs perpendicular to its adjacent ply, giving dimensional strength to the sandwich. This means that engineered wood flooring stands up well to areas with light moisture--basements and bathrooms. Another great thing about engineered wood is the range of installation options. The thinner varieties can be nailed down; the thicker kinds can be installed as floating floors. Floating floors are the great boon to do-it-yourselfers--no heavy staplers to lug around, no sub-floor. As long as your existing floor is level and stable, you can install the floating floor right on top. Engineered wood flooring's greatest weakness is its thin top layer. Remarkably, this 1/16" to 1/8" finish layer can be sanded. But only once or twice. Three is pushing it. In any case, I strongly recommend you seek the advice of a reputable flooring company before sanding. 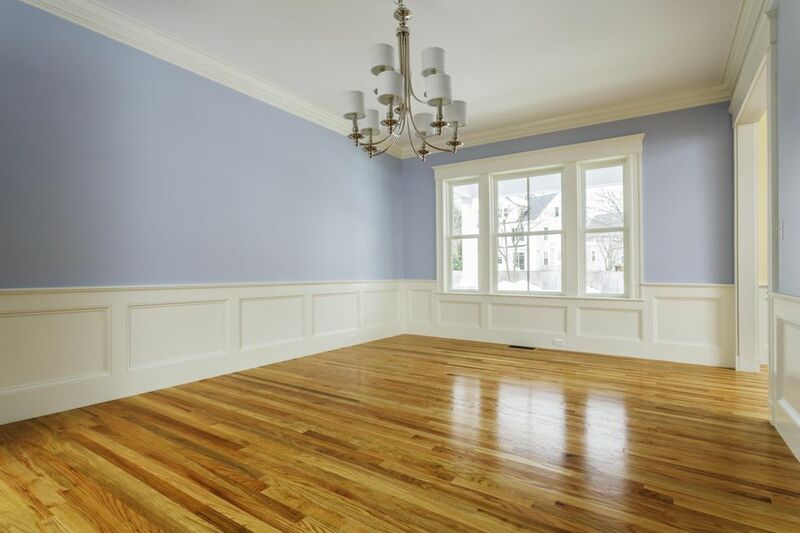 Unlike solid hardwood, deep scratches and dents in engineered wood cannot be sanded out. Laminate flooring is not real wood, at least not in the way that hardwood and engineered wood are. It's comprised of a thin top layer of resin-infused paper, all on top of a wood-chip composite. So, technically it is wood. But it's wood in the same way that sodas with 5% juice are called juice. Rather, the reason it's included in this article about wood flooring is that it is an amazing simulation of wood. The resin layer is essentially a photograph of wood. You can examine it with a magnifying glass and still be fooled. The other reason it's included here is that most people buy laminate flooring as an alternative to wood flooring. Among the advantages of laminate flooring are its scratch-resistance and the fact that it works well in topically moist environments like bathrooms and kitchens (unlike hardwood). And let's not forget: it's laughably easy to install. Disadvantages of laminate flooring: hard to walk on (foam underlayment is put down to soften this), it's slippery, and it cannot be sanded.